Six of our long stem yellow roses arranged and featuring purple dendrobium orchids in a hour glass shaped glass vase with lush greens and a yellow ribbon designed one sided. Arranged in a 12 inch hour glass shape vase. Fresh greens including lemon, huckleberry seeded eucalyptus pittosporum and myrtle are placed to hold the roses and orchids in place. We use six long stem yellow roses that measure 60 cm long and arrange them so that they face one side of the vase. 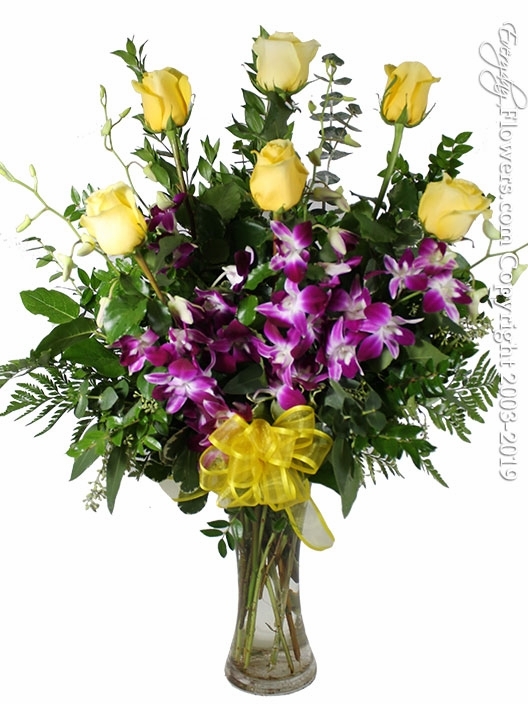 Four stem of Purple Dendrobium Orchids are also added to the arrangement. A hand tied silk ribbon is placed in the front of the arrangement.